This information is for verizon current frequencies only. Verizon may acquire more spectrum in the future. VDub2174, jecilop, dixondw and 3 others like this. Get a app called signal check in the playstore, lte discovery, tells you when you are on lte, signal check lets you know what lte you are on. But than again, you can have both on there because they compliment each other. Both developers of the apps respond quickly to questions if you have any also. Signal check is an excellent app, but it doesn't tell you the band, which seems to be frequently asked question for verizon users you can see additional information on the lte discovery app too by tapping on "show advanced stats". For the vast majority of people, lte discovery would be adequate. And most don't want two apps doing similar things. I have both actually but keep signal check just because it can give me lte dbm in the notification bar. Understandable. 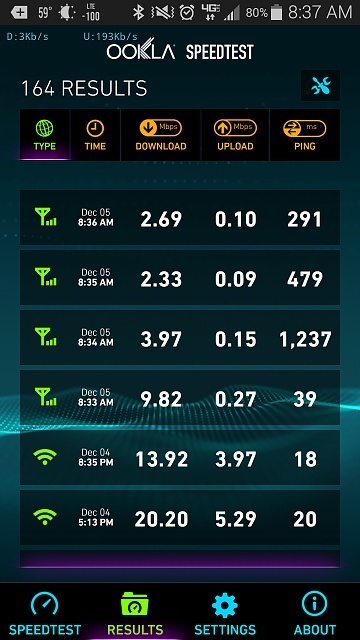 There have been some previous complaints of people claiming that xlte speeds are slow. Just want to make sure that they are really on XLTE. This has some reasons. I am sure if you need certain specifics that the developer could provide it. If I remember correctly, the first permission was necessary because we are running a background activity that actually executes separately from the main activity that is responsible for displaying the Live Notification mode and gathering logs for user. Of course, the app needs to check to be sure additional background activities are not spawned unnecessarily. The next two you listed were added because of our user requests, which we take really seriously. The app absolutely monitors to check if you are on a call or not! The reason being because many of our users, many being wireless engineers, run one of the discover modes of the application that continuously refreshes the connection. If the user receives a call during one of these cycles then the app pauses that so that it won't end up kicking a user off the call by refreshing the connection. Run at start up was a popular request that we actually just implemented. I personally never really saw the need for it, but we probably got at least fifteen emails a week from users asking for it. Since we added it I've actually found it really useful. (Disabled by default in the settings). The in-app purchase is really a feature that helps us out a lot. Really helps cut down on piracy which is a huge problem for us since our gains are very small compared to amount of time we devote to the app. A lot of people might not realize it but we have actually accumulated thousands of man hours into the application. My partner, Dan, works exclusively on the app almost all day everyday and I spend any time I am not working on my graduate projects working on the app. A break from grad school for me usually means an 80 hour week that goes into the app. So the in-app purchases just help us protect the small returns the app generates for us. You're never charged for something without you knowing and we refund nearly all the users who email us and say that they somehow "accidentally" bought the app. Any other permissions you may be interested in? I am going to be working on projects for the rest of the night and am presenting at an engineering symposium tomorrow, but I could get back to you tomorrow evening. Or if you email the feedback email address for us Dan could respond to you pretty quickly in the morning. danialgoodwin, jasoraso, mbryanr and 5 others like this. Thanks for the clarification, Spence. I wish Google would revamp or even define the permissions again. Silly question, but why would I need to know what band? In general, Verizon has much more capacity on band 4. Where I am, Verizon has 20+20mhz aws and 10+10mhz 700MHz lte. 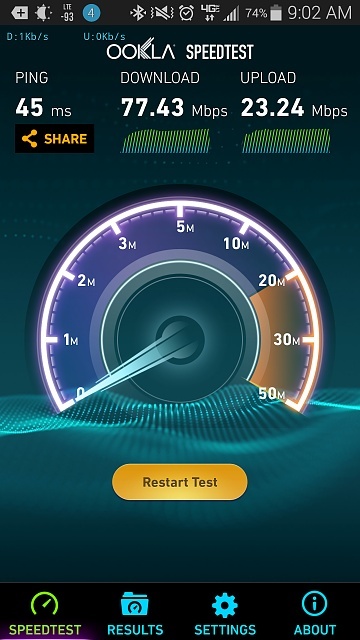 Add to it that not all phones are xlte capable. Particularly in areas of high load, a connection to band 4 can give much better speeds. At my work when connected to 700MHz, I get around 3-8mbps. On XLTE I get 30-60mbps. Just as an example, I went to an area of more limited cellular signal at my office. 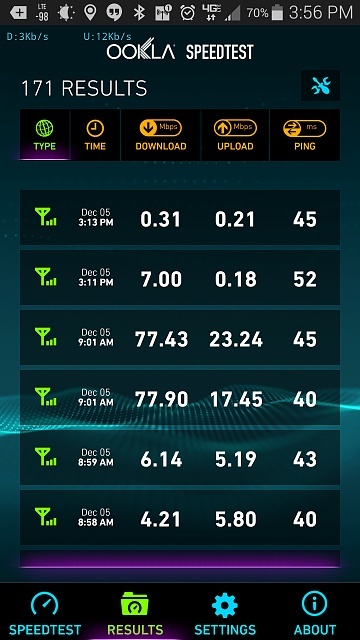 On XLTE I got 9.82mbps with 114 dbm. Aws typically has more capacity, and is usually faster. I know i'm not on a network listed by the app, but Id like to see the LTE frequency I'm connected to, is there alternate ways to work this out? Depends on your device and network. Samsung has *#0011# to view band information, however, Verizon has disabled it. What did you do to show band number 4 and 13 on notification bar? Thanks. I noticed that after my Verizon GS5 got lollipop the app doesn't recognize any of the bands. Anyone else having this issue? What's the point if they don't actually push the updates?